Before the Beatles and the Rolling Stones ever played a note, popular music was forever changed by a bespectacled kid from Lubbock, Texas – Buddy Holly! Now you can witness his story explode onto the Fireside stage in a toe-tapping, hand-clapping extravaganza, which will have you up and dancing. 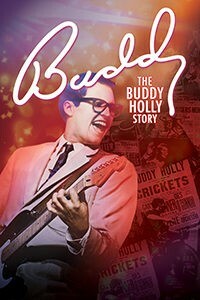 Buddy tells the true story of Buddy Holly through his short yet spectacular career, and features the classic songs “That’ll Be the Day,” “Peggy Sue,” “Oh Boy,” “Everyday,” “Not Fade Away,” “Heartbeat,” “Rave On,” as well as The Big Bopper’s “Chantilly Lace,” Ritchie Valens’ “La Bamba,” and many more! Viewed by over 22 million people in over 23,000 performances worldwide, “Buddy” has won numerous awards along the way. An included delicious lunch features Butternut Squash Soup, Roast Boneless Pork Chop, Whipped Yukon Gold Potatoes glazed with rich Pork Stock Gravy, Corn O’Brien, Cinnamon Apple Sauce, fresh baked breads and Almond & Fruit Lace Basket for dessert. Minimal walking.